Summary: I first visited Devil's Bridge during my Wales Coast to Coast in 2013, a walk from Conwy to Cardiff which included many sections of the Cambrian Way. I was so attracted to the place that first time that I vowed to return and explore it more thoroughly a year later. And so I did, incorporating this walk into the visit. 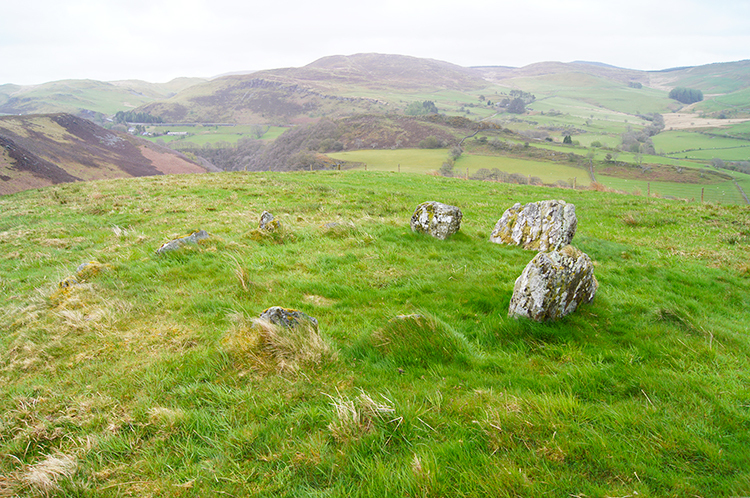 Apart for the dramatic finale the walk includes a walk over lovely Ceredigion countryside which includes a visit to a little known stone circle. 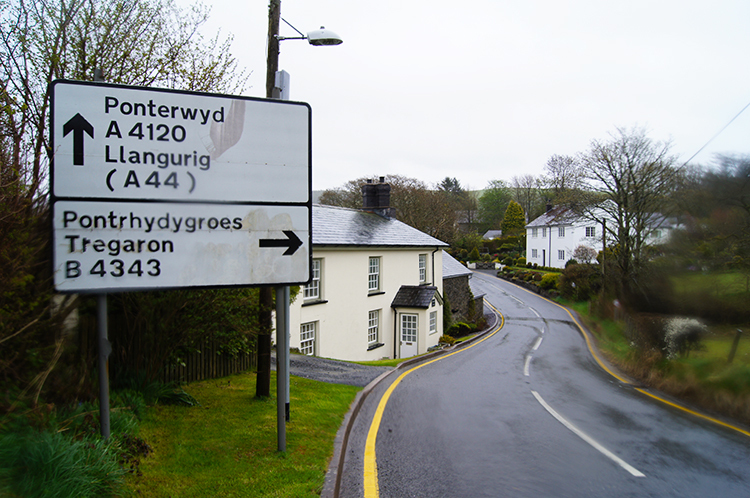 Afterwards the small village of Ystumtuen is visited before the route leads across more open countryside to the dramatic ancient woodland of the Coed Rheidol National Nature Reserve. 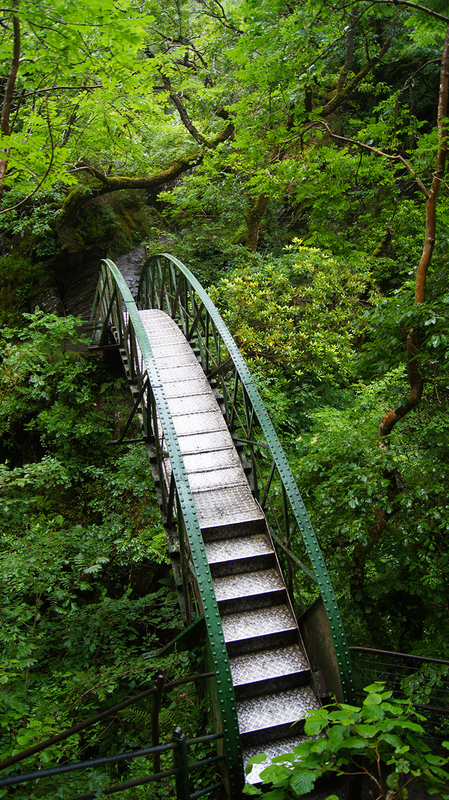 The woodland is set on the steep banks of the Afon Rheidol gorge which is descended into and after crossing the river is climbed from to reach Devil's Bridge and the exciting finale. It was not the best of days but so what. I was in hinterland country so the wild and gloomy conditions were appropriate for a land associated with being the back of beyond or the middle of nowhere. Fittingly for such a reputation it was eerily quiet when I arrived and parked up in the empty car park. I set off on my day of adventure in wild and wonderful mid Wales countryside with what seemed like the whole world to myself. No one was in sight as I made my way by paths, lanes, fields and a little bit of roadside to cross Afon Mynach by the side of a disused mill and track north over desolate country to Erwbarfe Farm. At the farm and a little before I had passed static caravan sites. Still no one had been about, the morning gloom must have kept the statics residents or holiday makers in front of morning TV. Not for me though, I was having a thrill and after the unpleasant part of the walk which took me along the side of the 4120 from Erwbarfe Farm to Ysbyty Cynfyn where a small church can be visited. 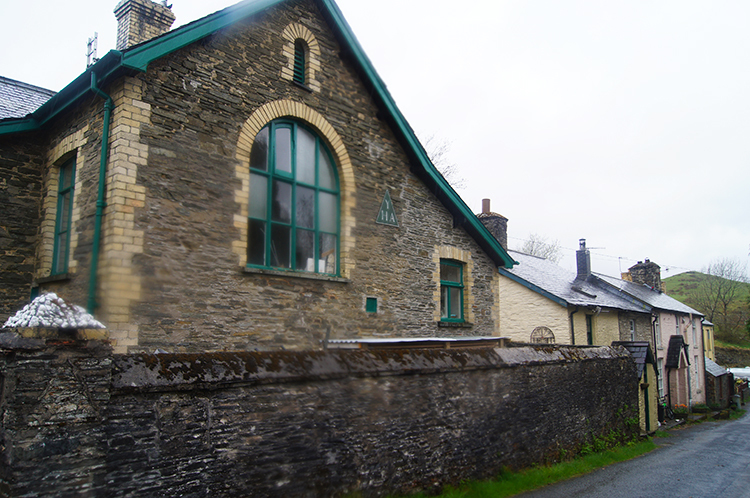 After leaving the roadside and passing the church I crossed a field and then descended a steep wooded bank to cross Afon Rheidol at Parson's Bridge. 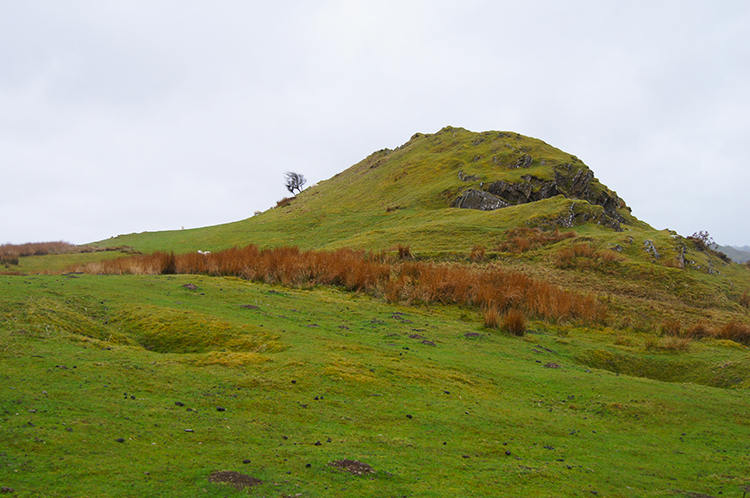 Then I climbed the west bank steeply making 130 metres height by huffing and puffing in short time to reach an unmarked stone circle on the south facing slope of Bryn Bras. It was a surprising find as there is no indication of the stone circle on the Ordnance Survey Explorer map. Viewing and admiring the stone circle in its elevated position allowed me to catch my breath. 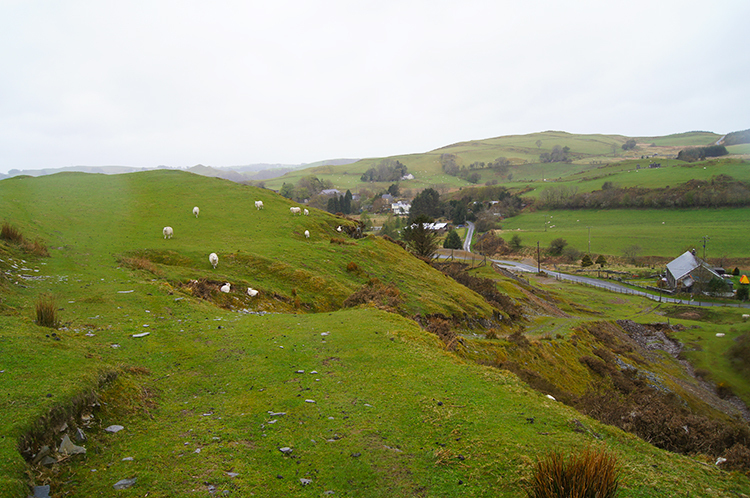 I admired the views of the wild Ceredigion countryside as I rested too. 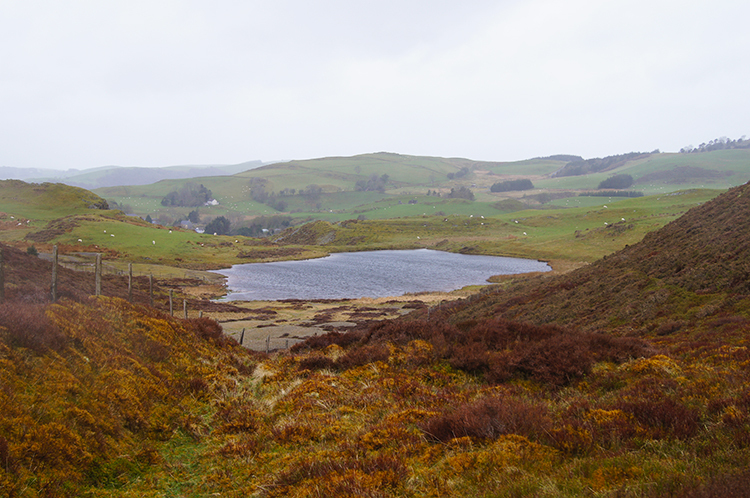 From the stone circle I tracked north-west through a slice in the middle of the hill to reach Llyn Bras. That is what I christened the water anyway, it is found in a quiet location at 300 metres elevation on Bryn Bras. At the tarn I came across movement, but not people who were still elusive. Sheep were resting by the waterhole and I was to see plenty of them from now on. These first ones were not pushy, just inquisitive. That would change. Beyond the tarn I passed on the south side of a small hill and then passed through a small local quarry which while looking disused also had recent tracks leading up to it. The locals have to get their building and field wall materials from somewhere so why not use the resources at hand. I would. I descended from the site of the small slate quarry reach a road leading through the village of Ystumtuen which looked forlorn. It had been prosperous in lead mining once which had been drawn from a mine near the site of the slate quarry I had just passed. Walking through the seemingly deserted village, I did not see one soul within it as I went, I was surprised to pass a youth hostel. Nothing stirred from the youth hostel either. Was it still used or not, the building appeared to be well maintained. 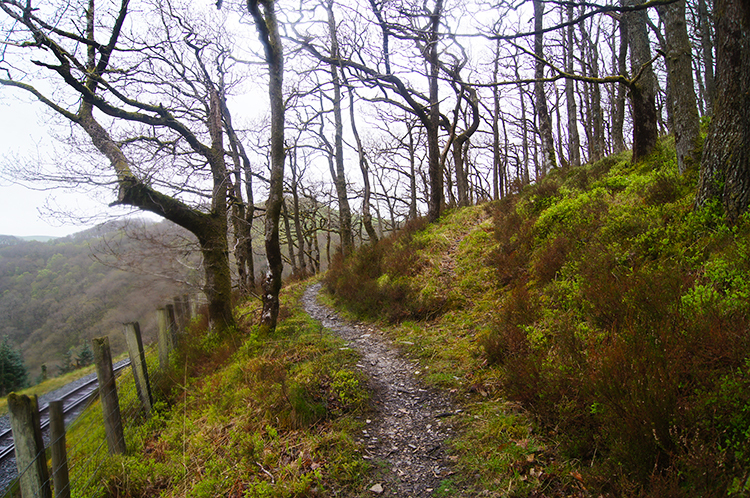 I continued on my way beyond Ystumtuen by following the Borth to Devil's Bridge to Pontrhydfendigaid Trail which led me on a slight descent along a ridge and by field sides to reach the entry point to the Coed Rheidol National Nature Reserve. From here the descent would get much steeper. The path had been a wide one from Ystumtuen to the nature but once I had climbed over a stile to access the wooded reserve things immediately changed. The path was now foot wide narrow so steps had to be made in one in front of the other fashion. And the going was slippery too in the wet conditions which had now set in with a steady drizzle falling. 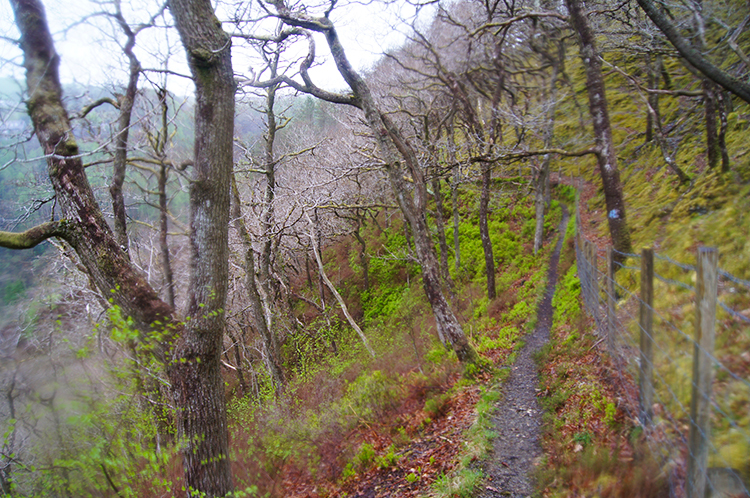 The path wound in meandering fashion down into the Rheidol Gorge around gnarled Birch trees. I took my time and concentrated on where I put my feet on the way down the precarious path which took me fifteen minutes to negotiate safely. In that time I had descended 100 metres. I had noticed the famous waterfalls of Devil's Bridge on the descent but not paid them too much notice as my attention had been on where I had put my feet. And I knew I would get up much closer to them at the end of the walk anyway. The walk eased on reaching the gorge bottom as I followed a ranger road to the Cottage at Pant-y-ddwyriw and then a metalled road to the point where I would cross Afon Rheidol for a second time. Afon Rheidol was flowing fast under the feet as I crossed the concrete footbridge. I expected eye-popping displays from the Devil's Bridge waterfalls later on. On the far side of the footbridge I read a sign telling me of what to expect on the continuing walk through the reserve. 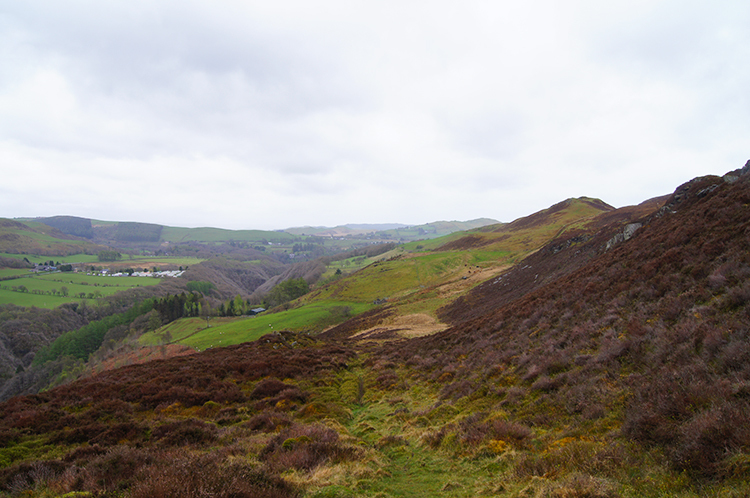 It said "The Rheidol Valley has some of the most spectacular views in Mid Wales. 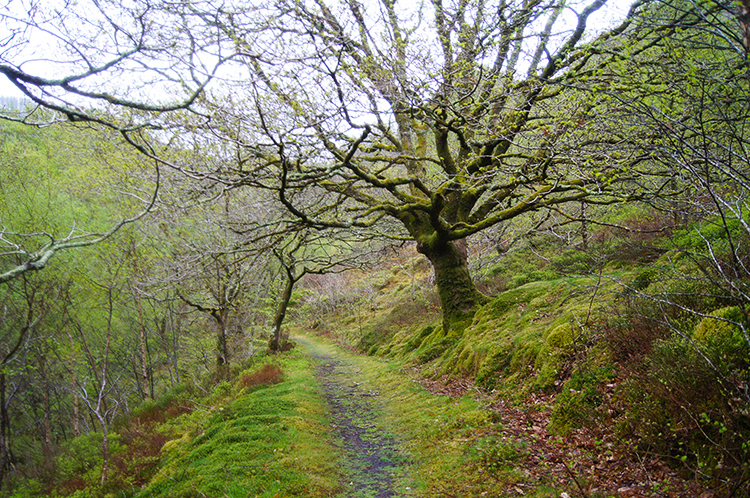 Coed Rheidol is an ancient Oak woodland, so typical in Wales. But the woodland's richness also lies in the great variety of plants and animals that can be found here". It added Coed Rheidol was particularly important for mosses, liverworts and lichens which carpet the trees, rocks and soil. 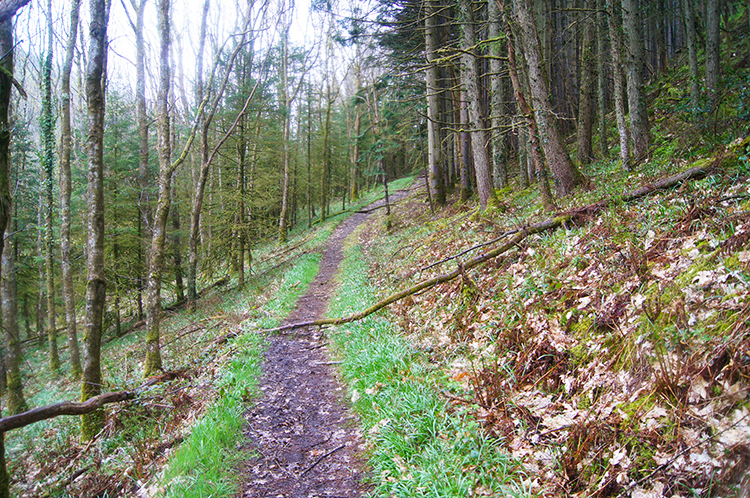 That was clearly evident, the path I followed was swathed in lush green mosses on either side. And the trees were festooned with green moisture loving plant life, none of which appeared to be causing any harm to their hosts. It was a gorgeous stage of my walk along this age old woodland trail which followed a line parallel to Afon Rheidol, following it upstream. The sign I had read also told me there were 70 bird species which have been seen in the reserve. It added "The pied flycatcher, redstart and wood warbler breed on the reserve, and look out for the red kites hovering above". I could not miss the red kites, one and then another appeared in the sky at regular intervals, each performing their gracious effortless flights. After a while I began to climb from the gorge. As I did so the erratic nature of the ancient woodland ceded to the military formation of spruce plantation. At least the mosses clung on to the sides of the paths where sufficient light got through the density of plantation trees. Inside the plantation it was a drab lifeless place. 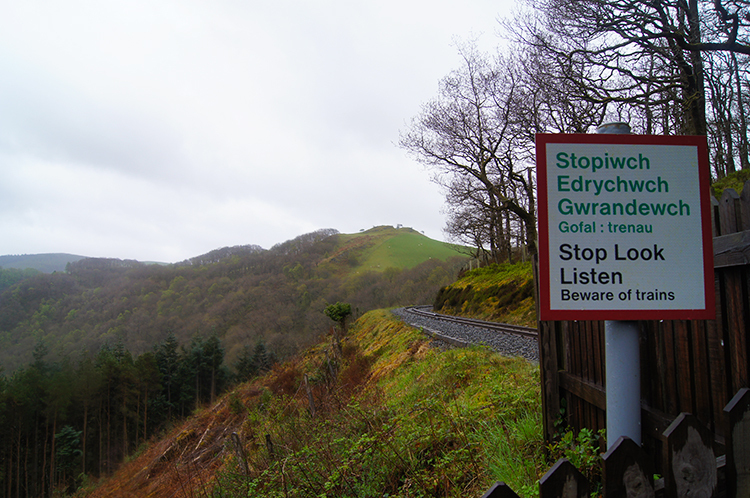 I climbed as quickly as I could out of the plantation and indeed out of the depth of Rheidol gorge to reach a 'Stop, Look, Listen' sign which informed me I had reached the point where I would cross the Vale of Rheidol Railway line. I had been near the Devil's Bridge end of the line and near the railway station when I had set off on the walk earlier in the day. I expected to see people viewing the trains and people also embarking on railway trips when I got back into Devils Bridge. Still I had not seen anyone all day yet. I crossed the railway safely and followed the path running close to the line and on the edge of more moss festooned picturesque woodland. The path led me away from the line and through the lovely woodland, duly leading me across a stream by way of a lovely footbridge to a point where I climbed from the wood and into a lush grassy field. I sensed something. I stepped into the field and began to find the path across it. It seemed quiet for the first few steps but then I realised I was not alone in the field. 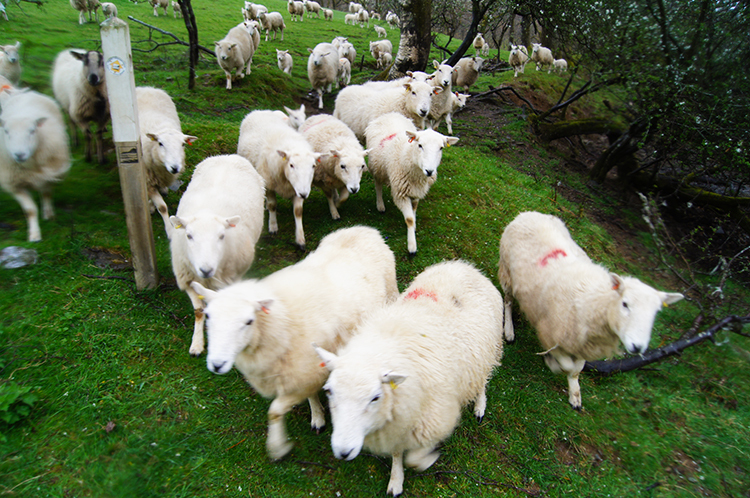 All of a sudden a great stampede of feet was hurtling towards me. The field was full of sheep and I guess they mistook me for the farmer who shepherds them. It was clear they expected me to have brought something for them as they corralled me, sniffed me and even nudged me in expectation of goodies. I said "Sorry, I have nothing for you" as I shuffled my way along the path and out of the field. I was quite relieved to get out of the push and shove. Into the next field I went which was empty of sheep. Suddenly it was peaceful again. The next field led me to the road leading into Devil's Bridge. The countryside and nature reserve chapters of my walk were over. Now for the next part. I walked along the roadside and down into Devil's Bridge. I passed the car park where my car was now surrounded by others. It was to the right. Directly to the left was Devil's Bridge Station and in it a train was puffing away, waiting to leave on its next journey to Aberystwyth. And now I saw people, lots of them. Some were on the train and some were waiting to get on. More people were just watching the stirrings, a few of them admiring the pretty steam train which would soon be making its way on the 11 and a bit mile journey on the restored heritage line. I left the scene of the railway to continue my walk down to Devil's Bridge gorge. A steady stream of people were leaving the car park and following me down the road. The railway and the gorge shared equal billing. 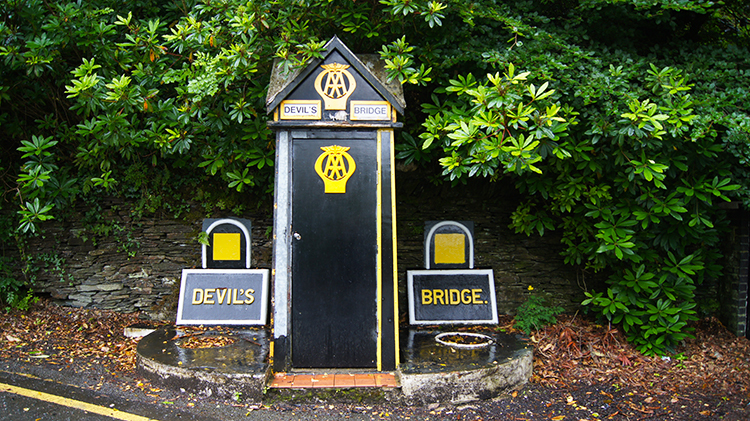 After passing the Hafod Hotel where I had stayed for one lovely evening during my Wales North Coast to South Coast walk of 2013 I passed the delightful restored AA rescue box and crossed the famous Devil's Bridge to join the queue waiting to access the falls. I was excited as I waited my turn to visit the falls as I knew what to expect, having made that first visit in 2013. I knew there was a precarious start to the trail though for not long into the trail the gorge is descended into by way of a steep stairway. 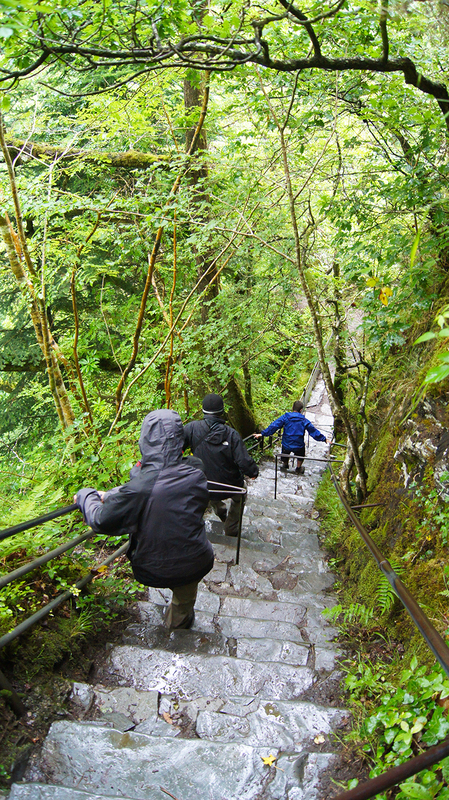 The steps, titled Jacob's Ladder are steep and slippery in the wet as it invariably is. Metal bars are set across the path at regular intervals and they need to be as a slip would be dangerous. I found them a bit scary the first time and again this time. I certainly took it slowly and stepped down as carefully as I could. The rewards for the effort are immense though. There seems to be waterfalls everywhere. 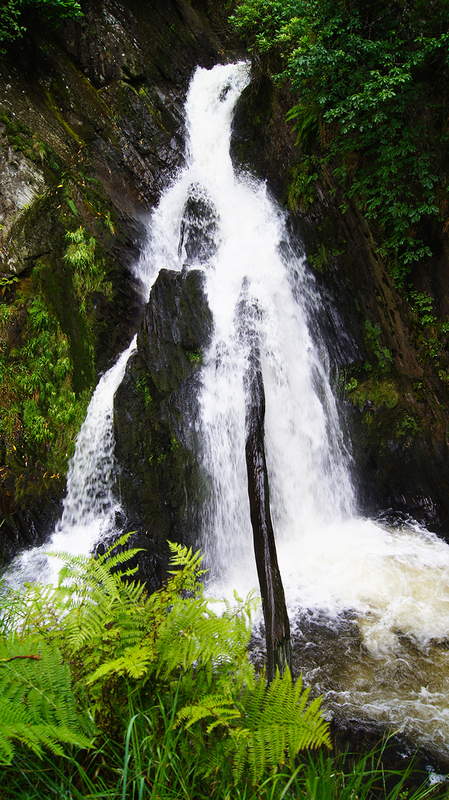 Mynach Falls is not just one waterfall, it keeps on going, a plunge down a sheer gorge. 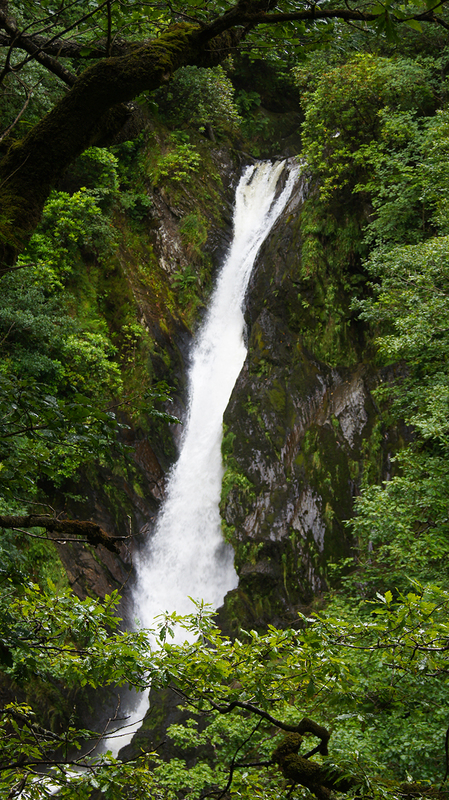 In fact Mynach drops 90 metres in five individual five waterfalls in a practically sheer descent. They are dramatic and they are awesome. I soon forgot about the steps. 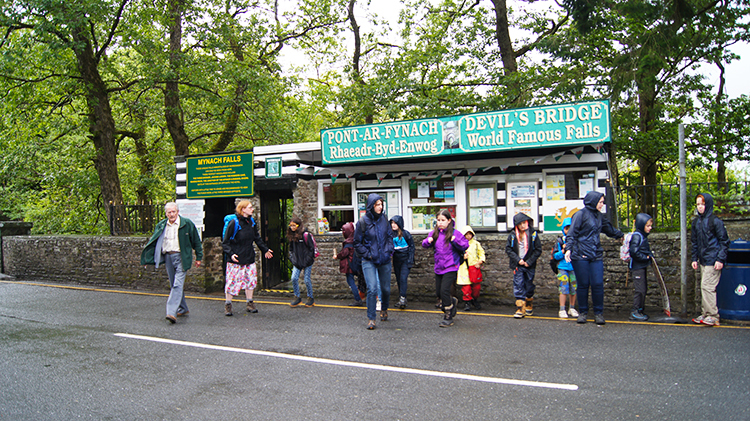 The walk around the trail is linear, in that it starts on the bridge and ends by exiting to the roadside outside Hafod Hotel by way of a turnstile. In between there is the steep descent into the gorge and a steep climb out of the gorge. And many places to stop and view the spectacles all the way around too. I was on the main trail for one hour, enjoying it all and taking it all in as much as I could. Each waterfall was as spectacular as the last and every moment a joy. Not only were the waterfalls are thrill but much more too. 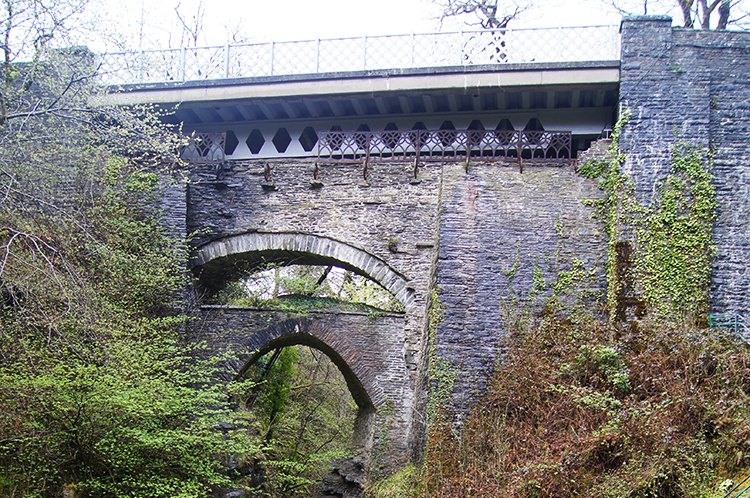 Including the lovely arched bridge over Afon Mynach and including more gorgeous mossed woodland set deep within the ravine. There was Robber’s Cave to explore too where the geology was striking. One hour of delight it was. I emerged from the turnstiles as much in awe of the gorge as I had been the first time. And still there was more to come. I went back on to Devil's Bridge and stood atop of the topmost of the three bridges before descending into the gorge again, this time on the south side so I could pop down to the Devil's Punchbowl. 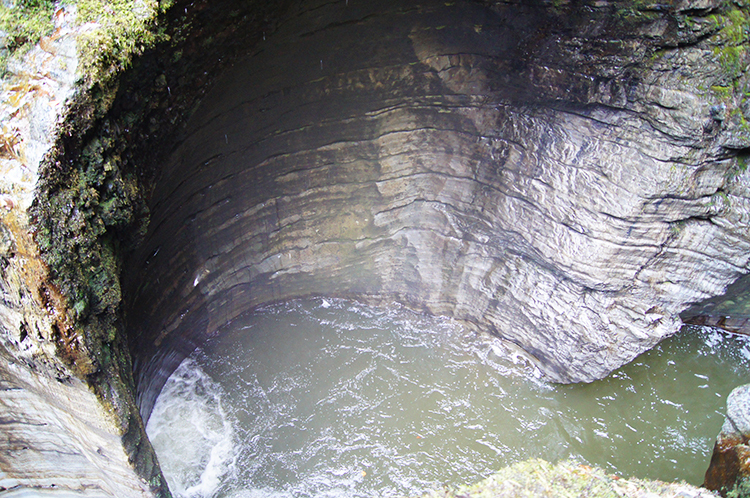 Here Afon Mynach has carved beautiful, large pot holes into the rock and in such natural symmetry. Breathtaking they are. From the steps leading down to the punchbowl is the best view of the three bridges too. The most recently built is an iron bridge (1901), which was built over a stone bridge (1753), which was built when the original bridge was thought to be unstable. The builders of the 1753 bridge used the original bridge (built 1075–1200) to support scaffolding during construction. So I was stood looking down to the Devil's Punchbowl and by raising my head and looking to my right I was looking at Devil's Bridge. Natural wonder and man-made wonder all in one. What a finale. 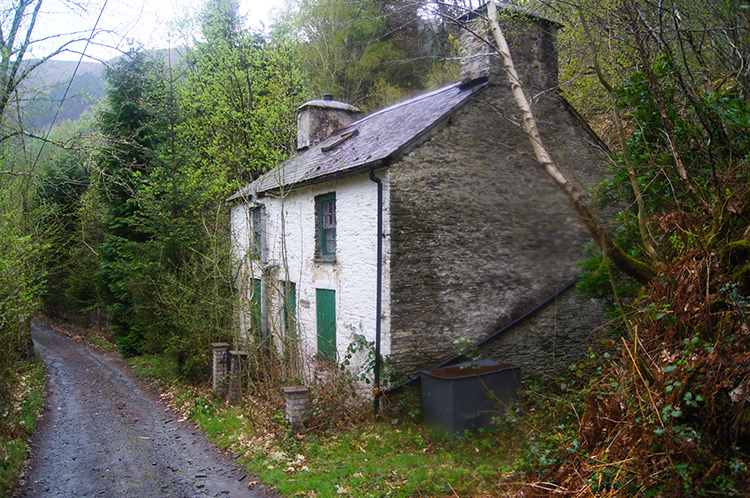 I was chuffed with my walk in Hinterland country. I fell in love with Wales when I first visited Snowdonia and I fell for Wales again when I explored the Brecon Beacons a little later. I have visited both popular regions many times since. And now I have fallen in love with the middle land. With such wildness and natural beauty such as I have found on this walk how could I not. The crowds in Devil's Bridge told me many have found it a beguiling place too. All they need to do now is walk a little further.